Art of Electronics, Horowitz & Hill Chapter 13. In this lab you will learn how to acquire data using LabVIEW, and use your knowledge to investigate Johnson Noise. Perform any circuit calculations use MatLab or anything that can be done outside of lab use RStudio (freeware). Plan out how to perform Lab exercises in this write-up. All parts spec sheets are located on the Physics 111 Library site. 1. What are the properties of a good data acquisition environment? 2. At room temperature, what would be the RMS noise across a 100k resistor sampled between 1kHz and 10kHz? 3. What is the predicted gain of the circuit used in Exercise 9.4? If you run the original VIs you will have full privileges to examine and edit the LabVIEW code. If you run the executable, you will not be able to examine or edit the code. The “LabVIEW Basics I: Introduction” (LVB1) interactive tutorial will be used to introduce LabVIEW programming. The tutorial is installed on the lab computers, and can also be installed on your personal computer along with LabVIEW and completed at home. You will demonstrate your new programming skills by completing selected exercises from an NI training course, found here: U:\BSC Share\LAB_9\LabVIEW 2016 Training Excercises.pdf. Most (but not all) of the exercises do not require the data acquisition hardware, and can be done on your own computer. Additional training exercises that were developed for LabVIEW 2012 might be useful, and can be found at U:\BSC Share\LabView Training. NOTE: if you receive the hardware error -50152 while working in LabVIEW, reboot the computer to resolve the error. Measurements of the charge collected on a plate from a cosmic ray. Measurements of the resistance of a semiconductor. Measurements of the radio signal from a pulsar. Measurements of the potential across a nerve cell. A spectral line converted to an electrical signal by a photomultiplier tube. The passage of an energetic particle converted to an electrical signal in a spark chamber. The separation between two masses in a gravity wave experiment measured by light interferometry and converted to an electrical signal with a photocell. The temperature of a liquid helium bath converted to an electrical signal by measuring the resistance of a semiconductor. The pressure in vacuum chamber measured with an ion gauge. Perhaps the last important non-electrical observations were photographs of astronomical images, and particle tracks in bubble chambers. Now even astronomical “photos” are taken electronically with CCD cameras, and bubble chambers have been replaced by silicon detectors. It is generally more precise and accurate. The much larger data sets that can be collected by computers are far more amenable to sophisticated analysis techniques. When properly programmed, there are no recording errors. Unfortunately, it’s a rare experiment that produces noise-free data. Noise comes from many sources. Some are intrinsic, like the Johnson Noise discussed later in these Background notes, while others are extrinsic, like the 60Hz harmonics picked up from the power lines. It is always best to minimize noise before collecting data, but inevitably we would like to “see into the noise”…to recover a valid signal from a noisy signal. Powerful signal processing techniques, like filtering, averaging and Fourier Transforms, have been developed to do this. Most of these techniques require extensive data sets. Frequently, computerized data acquisition is the only way to acquire enough data. Modern instruments like oscilloscopes, signal sources, and digital multimeters can often send their measurements to computers. The most common hardware interface protocol is called the GPIB bus, sometimes known as the HP-IB or IEEE bus. Powerful in its time, the GPIB interface is slow, expensive, difficult to use, and archaic. Recently, some instruments have been designed to communicate over Ethernet or USB. Whatever the bus, each instrument has its own set of programming commands, and recovering data from the instrument is generally painful. Standalone instruments are often the best choice for very high end applications, but many applications are well served by data acquisition cards placed inside standard computers. These cards are quite cheap and powerful, and can be much easier to use than standalone devices. The data acquisition card in the 111 lab computers. · Easy to learn, use, and debug. Some familiar programs provide data acquisition environments. For instance, with add-ins, Excel can be used to collect data, but it has very limited functionality, execrable graphs, is utterly undocumentable, and is inefficient. Add-ins are available for both Mathematica and Matlab, and both produce beautiful graphs. Matlab, in particular, has powerful data analysis capability. But their data acquisition functionality is limited, both are obscure and difficult to learn, have pathetic, 1970’s style user interfaces, and Mathematica is inefficient. 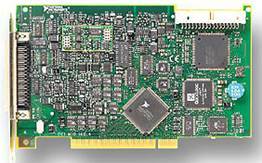 Most data acquisition cards also come with windows DLLs that can be called by C and C++ . Properly programmed, C and C++ are efficient and powerful data acquisition environments. But they are very primitive, have neither built-in graphing capability or analysis routines, and are difficult to learn and debug. Both can be documented, but, in the press of time, rarely are. You will learn to write LabVIEW programs in this lab. It should be fun and useful to you outside this course; almost all the physics labs in Berkeley, and many throughout the world, have adopted LabVIEW as their programming standard, and LabVIEW is widely used in industry. LabVIEW is not a panacea; for simple tasks it is unsurpassed, but, like any programming language, programming complicated applications is difficult. While LabVIEW does not resemble other languages, many of the programming guidelines you may have learned previously still apply: breaking functionality down into subroutines, testing subroutines individually, avoiding side effects like global variables, paying attention to memory management, and using efficient data structures are always worthwhile. where R is the resistance, T is the temperature, and is Boltzmann’s constant. The bandwidth B is the band over which one measures the voltage. In other words, if the signal from the resistor is sent through a bandpass filter which passes frequencies between and , the bandwidth is . The discovery and explanation of Johnson Noise, sometimes called Thermal Noise or Nyquist Noise, was one of the grand triumphs of thermodynamics. It is well worth reading Johnson’s and Nyquist’s original papers, which are available on the lab computers under “U:\BSC Share\LAB_9\”. Johnson Noise is of great practical importance; it is often the dominate source of noise in an experimental measurement. Normally noise is detrimental and an annoyance, but measuring the noise in a resistor is probably the easiest way to determine . We will perform this measurement in this lab. Problem 9.1 - Discerning signals in the presence of noise. This program generates several hundred cycles of a 100Hz, 1V RMS sine wave. The first four cycles of the wave are displayed in the top graph, and its spectrum in the bottom graph. Now increase the Noise Level. This adds Gaussian noise with the specified standard deviation to the sine wave. Notice how the wave is impossible to discern directly when the noise is greater than ten, but is nonetheless easy to discern in the spectrum. Further increase the noise to around forty. The spectral signal will have faded into the noise. If you didn’t already know where to find the signal, you would not be able to identify it. Now click the Continuously Regenerate Noise button, which will display the signal with a new noise set every 50ms. Your brain will average the instances, and the signal will become identifiable again. Finally, click the Averaging On button. This will be average the spectrum, with exponentially decreasing weighting, over the number of spectrums specified by the Averaging Depth control. Play with different Averaging Depths and Noise Levels, and see how small a signal you can see. Summarize your observations in your lab book. 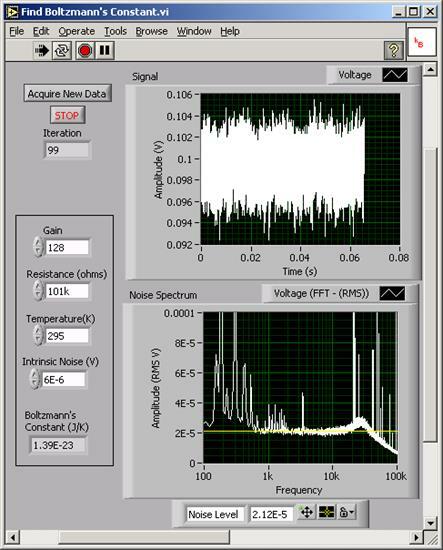 Properly programmed computers are generally better than humans at discerning signals in the presence of noise; for example, the spectral analysis in 9.1 was much more informative than the display of the unprocessed waveform. Occasionally, however, humans are better than computers, particularly when we have a well-informed notion of what the signal should look like. Take advantage of this fact when appropriate, always being aware that it is very easy to fool yourself. Humans are particularly good at facial recognition in the presence of noise. Load the program Visual Noise.vi. This program displays eight iconic portraits corrupted by noise. Images can be changed with the Picture # control, and the noise level changed with the Noise Level control. When the picture is first displayed, the noise will be set to 200, and the image will be unrecognizable. For each of the images, lower the noise in decrements of ten (200, 190, 180, etc.) until you recognize the image. Typically, you will need to lower the noise to below 150.
a) For images 1 and 2, sit close to the computer. b) For images 3 and 4, sit close to the computer, but switch on “Continuously Regenerate Noise.” As described in 9.1, this is equivalent to averaging the signal. c) For images 5 and 6, at each noise level, look at the screen from at least two meters away. Do not continuously regenerate the noise. Because the pixels blur when observed at a distance, this is equivalent to low pass filtering the signal. Bandwidth reduction is one of the most important signal processing techniques. d) For images 7 and 8, continuously regenerate the noise, and look at the screen from far away. You should find that you can discern remarkably noisy images. Summarize your observations in your lab book. Learn to program in LabVIEW by working through the interactive tutorial referenced above. This can be done on the lab computers or on your own time outside of the lab if you install LabVIEW on your personal machine. Develop your LabVIEW programming skills by completing the exercises in the aforementioned pdf. While you may work with your partner, both of you will be expected to learn to program in LabVIEW separately. Demonstrate the programs you created in the Exercises to the TA’s and discuss any confusing parts of the tutorial. Note: The file LabVIEW_Debugging_Tools.pdf contains explainations of a number of debugging tools that will be helpful to use when debugging your programs. Additionally, further (slightly out of date) training exercises that were developed for LabVIEW 2012 might be useful, and can be found at U:\BSC Share\LabView Training. The following exercises find Boltzmann’s constant via the measurement of Johnson Noise. Johnson noise is not large: for a resistance of 1Mohm, and a bandwidth of 100kHz, the room temperature noise level is about 40mV. Consequently, we need to build an amplifier to observe the noise. Since we measure Johnson noise over some bandwidth, we need to know the transfer function (frequency response) of the circuit. Load the program Amplifier Transfer Function.vi and connect the signals as described on the front panel. Find the transfer function of your circuit between 10Hz and 240kHz. 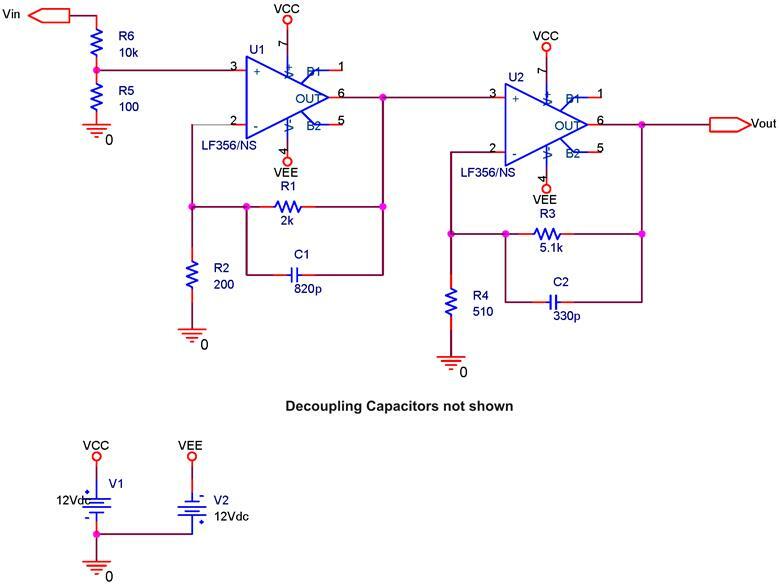 Note that the response of the circuit is deliberately rolled off (by capacitors C3 and C4) to avoid aliasing, a topic that will be discussed at length in the next lab. Over what frequency range is your amplifier flat, and what is the gain in the flat region? Please note that if your balance pins on the op amps are not trimmed correctly, then Vout will have a DC offset. This may cause the output voltage to exceed the maximum input of the LabView DAQ. To fix this, either trim your op amps to minimize the DC offset or manually change the input voltage range for the DAQ Assistant that reads Vout in the LabVIEW block diagram. NOTE: The calculation box on the left above is NOT a required part of the exercise. 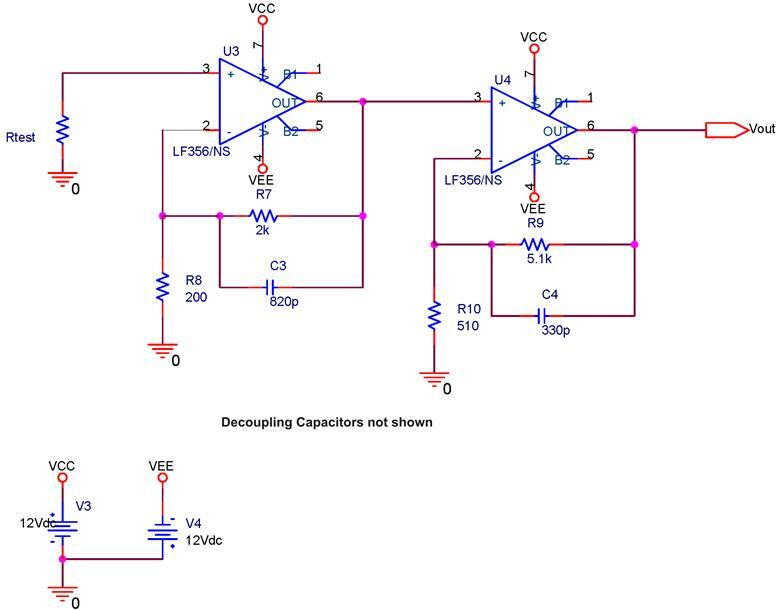 Convert the signal from the amplifier to a digital waveform. Use the DAQ Assistant express VI to read channel AI7. Configure the DAQ Assistant to read N Samples at 500kHz. The Samples To Read should be between 1000 to 100,000; the FFT routines used later prefer that the number of samples be a power of 2. Set the Voltage Range to be between about −200m and 200m. This range should be slightly greater than the size of the signal, but be warned that only certain ranges are available. The card will automatically coerce the specified range to the smallest available range that contains the specified range. The Trigger Types should be set to None. Display the signal on a waveform graph. Use the Spectral Measurements express VI to Fourier transform the incoming signal. Set the Spectral Measurement to Magnitude RMS, the Window to None, Averaging to on, the Mode to RMS, Weighting to Linear, Number of Averages to 100, and Produce Spectrum to Every iteration. Display the spectrum on a waveform graph. Incorporate all your code into a For Loop set for 100 iterations. As a reference, see the example program For loop.vi in the shared folder on the lab computers. Correct the labeling on all the graphs. Create a cursor on the Spectrum graph to display the spectral amplitude. 8. Use a property node associated with the cursor to automatically read the spectral amplitude and use the resulting value to calculate Boltzmann’s constant. Use a Formula Node for the algebra. Enclose your program in a While Loop to retake the data on command. Use a Wait For Front Panel Activity node to avoid saturating your computer with null cycles. Note that this is not wired into the circuit; it works when just put inside of the While Loop. Use a Stacked Sequence Structure with 3 frames to enclose all the code which is inside the While Loop, leaving only the Stop Button outside the structure but inside the While Loop. This will allow more control over timing. Hints: The Professor’s program uses these LabVIEW components. While Loop, Stacked Sequence Structure, Case structure, For Loop, Formula Node, Property Node, Waveform Graph, Equal to Zero?, Spectral Measurements, Wait For Front Panel Activity: among others. Have your working program signed off by the TA’s. Print a copy of the front panel (with data) for your lab report. Calculate Boltzmann’s constant for 10k, 100k, and 1000k resistors. An exponentially weighted average of a sample set, , is found by computing . This procedure yields a running averaging in which the most recent points are the most heavily weighted. The magnitude of the effect is substantially independent of the intensity of the causative agent. The effect is of a magnitude that remains close to the limits of detectability; or, many measurements are necessary because of the very low statistical significance of the results. It makes claims of great accuracy. It puts forth fantastic theories contrary to experience. The ratio of supporters to critics rises up to somewhere near 50 percent and then falls gradually to oblivion.